Use the controls to pan or zoom the map. Click a county to reveal data. Radon is a radioactive gas. It comes from the decay of uranium that is naturally occurring and commonly present in rocks and soils. It typically moves up through the ground to the air above and into a home through pathways in ground contact floors and walls. Picocuries per liter of air (pCi/L) is the unit of measure for radon in air (the metric equivalent is becquerels per cubic meter of air). Each year, radon is believed to be responsible for an estimated 21,100 lung cancer deaths in the U.S. (U.S. EPA, 2003). Smokers exposed to radon have a significantly higher risk of lung cancer; radon is the second leading cause of lung cancer after cigarette smoking. Radon-related lung cancer is the leading cause of lung cancer in non-smokers. An estimated 13.4 percent of lung cancer deaths in the U.S. are believed to be radon-related (U.S. EPA, 2003). To reduce the risk of lung cancer, EPA has set a recommended "action level" of 4 pCi/L for homes. At that level, it is cost-effective for occupants to reduce their exposure by implementing preventive measures in their homes. This indicator presents (1) the number of U.S. homes estimated to be at or above the EPA recommended radon action level of 4 pCi/L and without an operating radon mitigation system (i.e., the estimated number of homes needing mitigation) and (2) the number of homes with an operating radon mitigation system. The difference between the homes in these two categories is the number of homes that have not yet been mitigated (generally, homes are only mitigated if the EPA recommended radon action level of 4 pCi/L or more is measured). The data for this indicator were extracted from the National Residential Radon Survey (U.S. EPA, 1992a), which estimated radon levels in the U.S. housing stock. The number of homes at or above 4 pCi/L was estimated by applying the results of the Radon Survey (U.S. EPA, 1992a) to 2000 U.S. Census data on the number of U.S. households. The 1992 National Residential Radon Survey was based on the housing stock that would be covered by EPA's radon testing policy (i.e., homes that should test). This included only homes intended for regular (year-round) use and covers single-family homes, mobile homes on permanent foundations, and multi-unit and group quarters (U.S. EPA, 1992b). The 1992 residential survey estimated that about one in 15 homes in EPA's "should test" category would have a radon level of 4 pCi/L or more. The measure of the number of homes with operating mitigation systems was developed from radon vent fan sales data provided voluntarily by fan manufacturers (U.S. EPA, 2014). There was a 611 percent increase in the number of homes with operating mitigation systems from 1990 to 2013, going from 175,000 to 1,244,000 homes over 24 years. During the same period, there has been a 14 percent increase in the estimated number of homes needing mitigation (i.e., having radon levels at or above 4 pCi/L and no mitigation system); that number increased from about 6.2 million to 7.1 million homes (Exhibit 1). Exhibit 2 shows radon potential in homes at the county level based on indoor radon measurements, geology, aerial radioactivity, soil permeability, and foundation type. 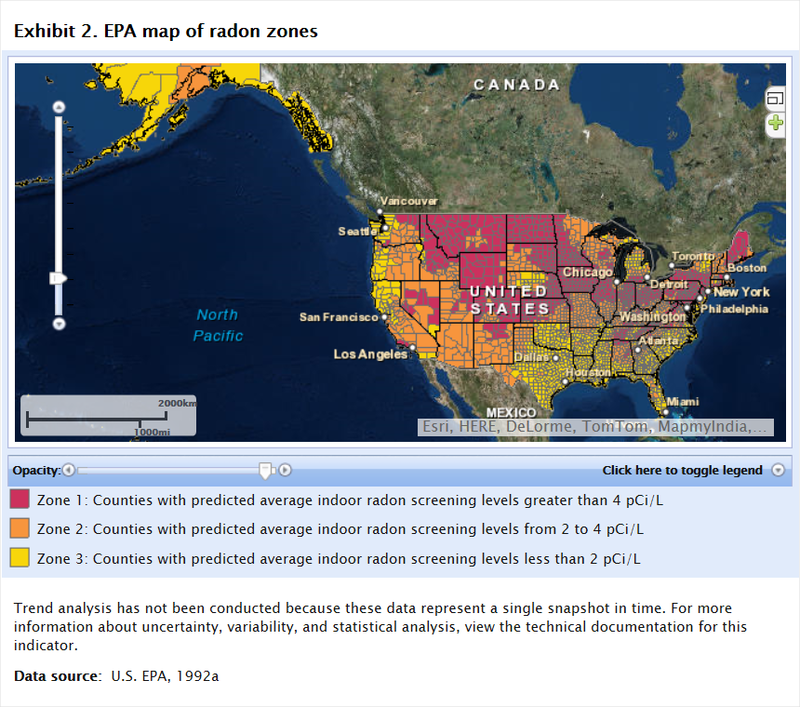 Zone 1 is the highest radon potential area, followed by Zone 2 (medium), and Zone 3 (low). It has been reported anecdotally that radon vent fans and mitigation systems are also being used to control for soil gases and vapor intrusion in homes in the vicinity of Superfund sites, underground or aboveground storage tank sites, and similar sites as an element of corrective action plans. While radon vent fans and mitigation systems used in this way may provide a radon reduction benefit, they could be considered a subtraction from the number of homes with operating mitigation systems, thus slightly reducing the slope of the trend line. The indicator presumes that radon vent fans are used for their intended purpose; the available information supports this premise. Even if fans are used for managing vapor intrusion, a radon risk reduction benefit still occurs. A home with an operating mitigation system is presumed to have a vent fan with an average useful life of 10 years. Each year the total number of homes with operating mitigation systems is adjusted to reflect new additions and subtractions (i.e., vent fans installed 11 years earlier). The number of homes with radon levels at or above 4 pCi/L is an estimate based on one year of measurement data extrapolated for subsequent years based on population data, rather than on continuing measurements. This indicator does not track the number of homes designed and built with radon-reducing features, and without a vent fan (passive systems). These features can help diminish radon entry in homes. Thus, more people are likely to have a reduced risk from exposure to radon in indoor air than suggested by the trends in operating radon mitigation systems alone. However, homes with passive systems only should be tested to determine if they are at or above EPA's radon action level. Summary data in this indicator were provided by EPA's Office of Radiation and Indoor Air, based on two types of information. The estimated number of homes with estimated indoor air concentrations at or above EPA's radon action level and without mitigation systems was originally derived from the National Residential Radon Survey (U.S. EPA, 1992a) and is updated with U.S. Census data; and the number of homes with radon mitigation systems was developed from unpublished sales data provided by U.S. radon vent fan manufacturers (U.S. EPA, 2014). U.S. EPA (United States Environmental Protection Agency). 2014. Unpublished sales data provided by radon vent manufacturers. U.S. EPA. 2003. EPA assessment of risks from radon in homes. EPA/402/R-03/003. Washington, DC. June. https://www.epa.gov/sites/production/files/2015-05/documents/402-r-03-003.pdf (PDF) (98 pp, 526K). U.S. EPA. 1992a. National residential radon survey: Summary report. EPA/402/R-92/011. Washington, DC. October. U.S. EPA. 1992b. Technical support document for the 1992 Citizen's Guide to Radon. EPA/400/R-92/011. Washington, DC. May.